Well, i am reviewing a product "Roop Mantra Mix Fruit Face Wash" in today's post. Monsoon season has its pros and cons, but it's a season that is always welcomed after scorching summer. However, in monsoon, skin needs some extra care owing to humidity and moisture in the air all day long. Even though i have dry skin i always find my skin having oily and greasy texture in this season. This irritates me much and it seemed difficult to leave house with such a skin. In the quest of perfect creme and facewash that can keep excess oil away from my skin and make it glowing, i stumbled upon many such products, which proved to be waste of money. Also my skin was exposed to different ingredients which made it more oily. However the quest ended when i received a hamper from Roop Mantra consisting of many of their ayurvedic products. I randomly picked Mix Fruit Face Wash (as i was already brooding over useless facewashes, i hoped this one might do some magic). On first wash i felt excess oil disappearing but i was to be sure. I used it for more than ten days now and i can say confidently that it did magic!!! Yes it worked exactly the way i wanted it to and finally this medicinal ayurvedic face wash did wonders on my skin. The best part is you can take a drop or two of the face wash and it very gently cleans it with such a small quantity. One facewash can last upto 1 month. 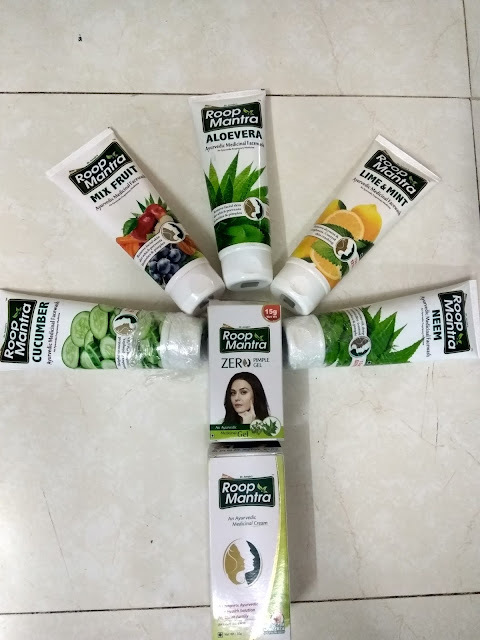 As Roop Mantra describes it, it says, "Roop Mantra Mix Fruit Face Wash is a medicinal face wash which is a blend of natural fruit extract like Apple, Grapessed, Carrot, Aloe Vera and Almond, providing complete nourishment to the skin." There are few more facewashes of which i will be writing my reviews in upcoming posts.